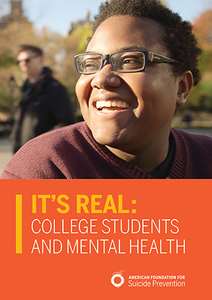 This package contains the DVD and facilitator’s guide for the It’s Real: College Students and Mental Health program. The film is an AFSP-produced documentary featuring the stories of six college students from across the country. It reveals depression and other mental health conditions as they are commonly experienced by young adults, and shows how students can seek help for these conditions and successfully manage them. 17-minute film, followed by 5-minute expert commentary. © 2018 American Foundation for Suicide Prevention. All rights reserved.